First of all I want to thank my family and friends (including Rebecca!) for donating to my run for Kennedy Krieger! I was able to raise $250 for a cause that I support so strongly! Not even a week ago, I hopped in my car to drive 500+ miles south to Baltimore. I’d begun training for a marathon, got hurt and took a month off running, and did a short, low-mileage half-marathon “training plan”. 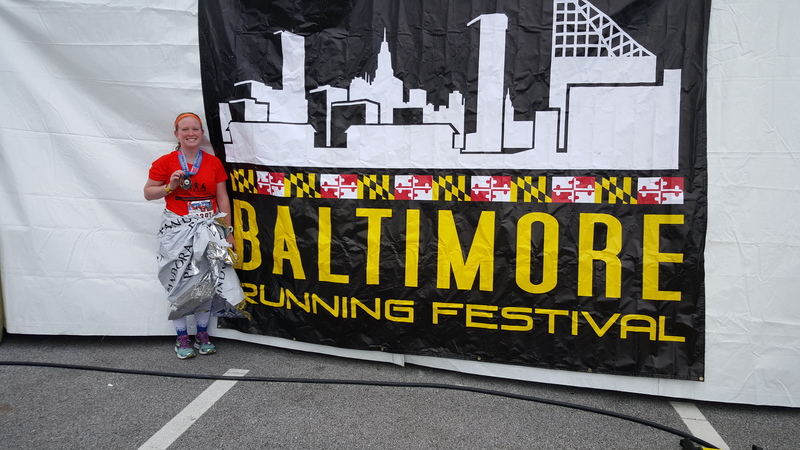 I’d been dreaming of running the Baltimore half-marathon one day, and the time had finally come. I had a great time the Thursday before the race. I stopped by Kennedy Krieger to pick up my charity bag and then after driving through the hood and getting lost I finally made it downtown. After grabbing a drink with a friend we went to the expo! This was my first ever race “expo”. It was super overwhelming but I sort of loved it. THERE WAS SO MUCH STUFF! 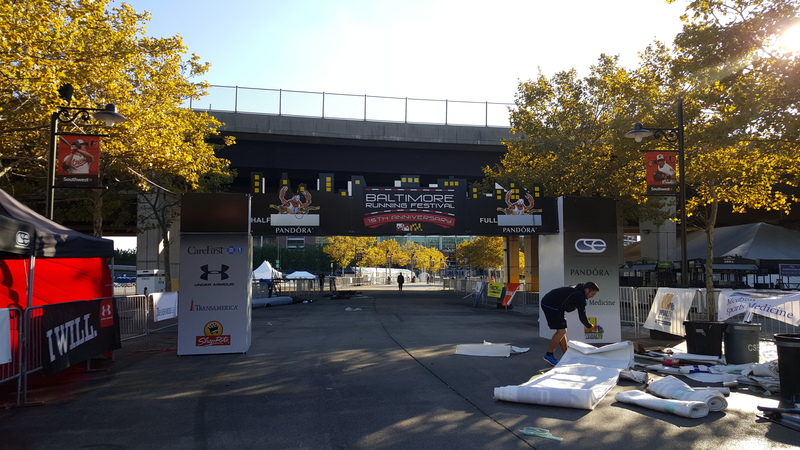 However, I didn’t love how it was organized; making you to walk from one end to another, through all the crowds to get your bib and shirt. It made sense in a way, but I ended up feeling super disorganized. I went through once with my friend Ben, and again with Beth. All in all, I liked the expo, loved all the shopping, and was happy I only spent about $70. I could have done a lot more damage! 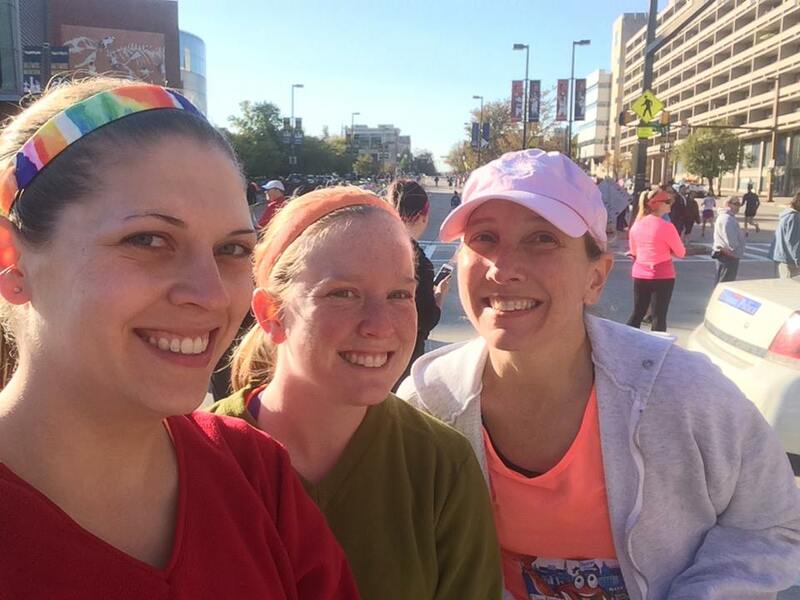 I spent the day before the race relaxing – spending time with friends while watching too much Friends. I ate lots of spaghetti, had a couple glasses of wine and of course set out my “Flat Sam.” I was feeling really good going into Saturday morning. On Saturday we (Beth, her Aunt, and I) were up bright and early to drive to the lightrail. I had just an english muffin for breakfast, which I later learned was not nearly enough. We were downtown by 8:45 with an hour for stretching, bathroom stops, and pondering what we were about to do. It was chilly, so I was super thankful that Beth’s Aunt gave us clothes she was going to donate to use for throw-aways. I was so ready when the gun went off at 9:45. About 10 minutes later we crossed the start and I knew I wanted a PR. I knew to take it easy the first few miles for the hills. 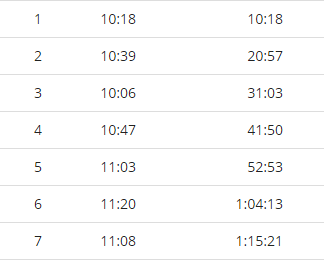 I tried to go out a bit more conservative, while staying on pace for what my current PR is (2:15). 5 miles later I regretted it. I regretted everything. It didn’t take too long for my too-fast start to catch up with me. The hills were killer. I expected them, I knew I should have gone out easier, but they were harder and more frequent than I expected. By mile 4, my quads were on fire and my right hip was really bothering me. 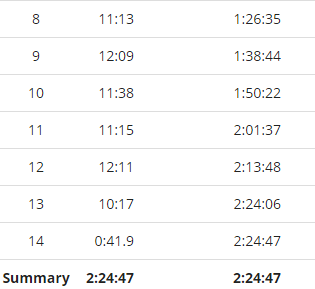 It wasn’t bad to the point of needing to stop and walk outside of my prescribed 4:1 ratio, but it definitely nagged me for the rest of the race. 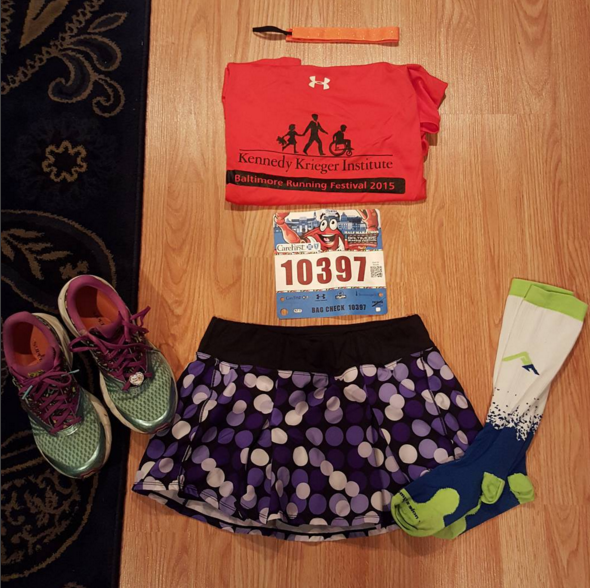 I eventually re-evaluated my goal to simply finish under 2:20 (spoiler alert -didn’t happen). That smile and wave don’t match how my quads were feeling. 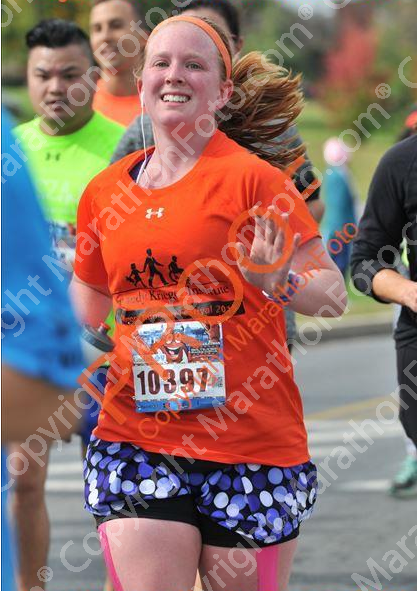 It was around mile 7 that I got awful hunger pains and a splitting headache. I wasn’t able to stomach my second gu at 90 minutes and taking some peanut M&Ms from someone ended up in me almost puking on the person in front of me. I also thought for some odd reason that the course flattened in the second half. Nope, nope, and nope. I have never felt so physically awful during a race. If the hip pain wasn’t enough, my stomach felt absolutely horrendous. I spent most of my 1:00 walk breaks trying not to keel over. As expected, once the stomach ache and head ache hit, my legs were already shot from the hills and weren’t coming back for me. While my pace slowed and my goals fell further from reach, my spirits stayed surprisingly high. I took an extra walk break when I needed it at mile 12, and was able to finish the last 1.1 miles at a decent-enough pace for how I was feeling. As awful as I felt, the last half mile was incredible. The people of Baltimore lined the streets, I could see Camden yards, and I could hear the finish music. This was the moment I’d been dreaming of, running through the stadium. I forgot how awful I felt and while I didn’t have a kick left in me, I finished with all I had. Hearing my name over the loud speaker was incredible, and I was so proud when people yelled “Go Kennedy Krieger!”. I finished with my slowest time of the year, 10 minutes slower than my PR. It sucked, really sucked. I wanted a PR to bad, and I ruined it with going out too fast and not eating enough. However, I’m not mad. While this race didn’t go as planned, it was perfect in many ways. I finished feeling sick, but also feeling healthy. Sure, I had aches and pains, but no part of me felt injured. After going through my injury this summer, that was my main priority. There was never a point where I hated running. Typically during a half, I get to mile 10 and hate my life. While I hated how I felt, I never once wanted to stop running. I was determined to finish, especially for the Kennedy Krieger Athletes and all who had supported my fundraising. It was a welcome reminder that you can’t always PR, and that this course isn’t necessarily for PRing. I love large races! I loved always running with people instead of being nearly alone half the time. Loved. It. This race was such a learning experience for me. It was my first race where I experienced major fueling problems. It was also my first large race. I learned how strong my mentality can be even when my body is rebelling. I ran the streets of the city I love with people who also love it, as I had dreamed of since I was a freshman in college. While the race didn’t go as planned, I’ll be back next year, happy as can be (and hopefully with more food in my stomach). Way to push through. The Baltimore half is so hilly ugh. I remember always thinking the hills would be over but it’s kind of rolling in the back end of the course. I do love the whole running festival and running through the city though! I mentally couldn’t get over the hills, but I loved everything aside from that. I will definitely do it again next year but not as a goal race! Great job! I think it’s awesome you stayed positive the whole time, despite some setbacks. And congrats on your fundraising! I had a friend who ran this and she said the hills killed her! I’m glad you were able to push through and finish, it will only make you a stronger runner!! Thanks Court! I totally agree. The little mini hills on my route yesterday felt like chump change after the Baltimore Hills.